Draw Wire displacement sensors measure linear movement of target position and velocity that are suitable for both integrated and subsequent installation. The draw-wire sensors are used for simple distance measurements ranging from 50 to 50,000 mm; therefore, draw wire sensors are ideal choice forlarge displacement applications at a low cost and they are extremely attractive for OEM applications. Sensor mechanics 1.5 – 50m Depends on encoder ±0.01% F.S.O. 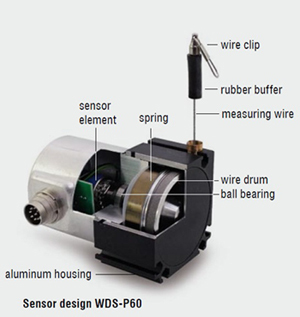 Draw wire displacement sensors measure linear movements using a highly flexible steel cable. The cable drum is attached to a sensor element which provides a proportional output signal.Measurements are performed with high accuracy and high dynamic response, and the measuring drum is axially coupled with a multi-turn potentiometer, an incremental encoder, or an absolute encoder, thus, a linear movement is transformed into a rotary movement and then converted into a resistance change or into countable increments.The use of high quality components guarantees a long life cycle and high operational reliability. MICRO-EPSILON offers a wide selection of draw-wire displacement sensors with numerous types of output signal which meanseach customer has the opportunity of selecting the best sensor for his application. Choose between analogue and digital outputs to optimize individual measurement task. Draw wire sensors in the wireSENSOR series are application friendly due to the excellent measurement range to size ratio and the fact that they are easy to mount and use. The draw wire sensors are used for simple distance measurements between 50 and 50,000 mm and ideally suited for both integrated as well as subsequent installation. The rugged sensor construction ensures reliable operation even under difficult ambient conditions.There are extremely attractive variants particularly for OEM applications.For more details pleases download product brochure here. More application portfolio please click here. To view the brochure, you will need to have a PDF reader. If you don’t have one installed, please download a free copy from the Adobe PDF Reader site. Please complete the enquiry form below for specific information and advice on Draw Wires.